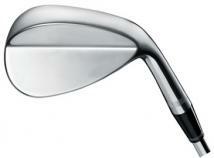 True Temper Steel Shaft 55 degree loft. Wilson Harmonized Black Chrome Wedges Features: 1 selling wedge in the country from the company that invented the sand wedge. Tour proven head shapes Classic blade shapes with modified bounce angles for dead stop spin and verstility from sand or fairway True temper shafts Premium steel shafts for high performance and rliability Black Chrome Tour endorsed finish reduces glare Also Available in 52 & 60 Degrees. A specialty lob wedge. 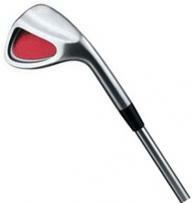 An excellent club for players with a steep angle of approach who wants to lower the trajectory of their pitches. The thin sole features additional camber, making it easier to make crisp contact. 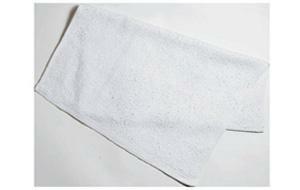 Performs exceptionally well in medium-to-firm conditions. Two-level sole design offers shot-making options and excellent performance, whether you're playing from the sand, the rough or the fairway. Available in lofts of 52, 56 and 60 degrees, Two-level sole plays in thick or tight lies. Cavity-back design promotes lift. Steel shaft, stiff flex. Cleveland 588 Series Chrome Wedge feature:- 8620 carbon steel clubhead provides the soft feel of a forged club, Standard clubhead size and standard flange, U grooves for increased spin. Bright chrome for long-lasting durable finish. 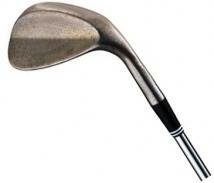 Cleveland Tour Wrap grips by Golf Pride, Cleveland Steel Shaft by True Temper:- 1. Offers increased feel and feedback to the golfer. 2. 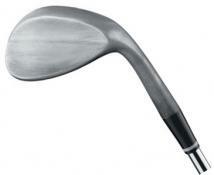 Available in Wedge shaft flex. 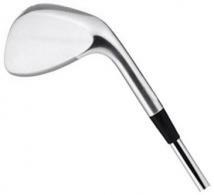 Cleveland 588 Series RTG Wedge feature:- Model 588 features a standard clubhead size and standard flange, 8620 Carbon Steel clubhead offers a soft feel like a forged club, Unchromed finish reduces glare. Special grind on the sole produces increased spin; face can be opened easily, Unpainted \\U\\ grooves increases spin on the ball, Many PGA Tour players prefer this club because of its versatility, superior feel and reduced glare. Clubhead will rust, Excess rust can be removed with steel wool, Cleveland Tour Wrap grips by Golf Pride, All models available in right-hand. Dual(53°), Sand(56°) and Lob(60°) wedges available in left-hand, Dynamic Gold Steel Shaft by True Temper:- Offers increased feel and feedback to the golfer, Available in Wedge shaft flex. Beautiful new forged traditional wedges designed by the master, Roger Cleveland, Forged from 1020 carbon steel for a softer, better feeling wedge. 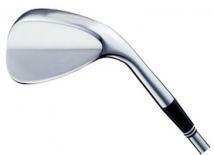 Slightly more compact head with bounce and sole width adjusted to accommodate each loft for versatility. All feature a True Temper Memphis steel shaft, Available in 48, 50, 52, 54, 56, 58 and 60 degree lofts in right-hand, 52, 56 and 60 in left-hand. Beautiful new forged traditional wedges designed by the master, Roger Cleveland, Forged from 1020 carbon steel for a softer, better feeling wedge. Slightly more compact head with bounce and sole width adjusted to accommodate each loft for versatility, True Temper Memphis steel shaft. Available in 48, 50, 52, 54, 56, 58 and 60 degree lofts in right-hand, 52, 56 and 60 in left-hand. As in the Nike Forged Irons,Precision Forging forms the head of the wedge, then it is Squeezed Forged under extreme pressure to align the grain of the soft 1030 carbon steel. Forging the soft 1030 carbon steel also improves feel and performance while eliminating soft and hot spots on the face.Very important for managing the subtleties of a 42 yard wedge shot.Particular care has been given to the heel grind with the drop-away heel giving golfers total freedom to lay open the face, creating a variety of finesse shots without the interference of unwanted bounce. The heads are finished with a deep,durable Tri-Plex nickel and chrome plating buffed to a high satin-gloss finish.